If you would like to have your link added to this site, please email LaVida Chihuahua's. For Kansas Country store goodness you can order online . THE ONE THING THEY CAN ALL USE WHEN THEY ARE FIGHTING FOR OUR COUNTRY IS OUR PRAYERS FOR THEIR SAFE RETURN. AKC is the largest and second oldest purebred dog registry in the world. Founded on September 17, 1884, the AKC was formed as a "club of clubs" to promote the sport of purebred dogs and breeding for type and function. The Canadian Kennel Club (CKC) is the primary registry body for purebred dogs in Canada and currently recognizes 174 breeds. As a non-profit organization, the CKC is dedicated to encouraging, guiding, and advancing the interests of purebred dogs. Established in 1898, the United Kennel Club is the largest all-breed performance-dog registry in the world, registering dogs from all 50 states and 25 foreign countries. UKC promotes the interest of owners, breeders and enthusiasts who work to balance beauty and working performance to produce happier, healthier dogs. InfoDog was the first totally interactive web site dedicated to the sport of Dog Shows and remains today – the most comprehensive and reliable web resource available for information on AKC Dog Shows, judging panels, online entry, judging schedules, and show results. For the best in doggie diapers try poochie piddle pants ! I am the Owner of a really great chihuahua group . We love to chat chihuahua's and show off our fur kids . 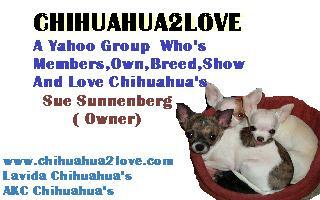 If you have an intrest in chihuahua's be it pet-show-or breeding check our group out . Some of my breeder friends are listed below with the links to there web sites. If you are looking to purchase a chihuahua's i'm sure we can help you out in your search for just the right one . It is a place to find out if a chihuahua is the right dog for you . All of the group members will help in anyway they can .